Drunken Lonely Wrexham Lager Swillers Thread. To be fair, Leyton Orient should be beating the likes of Wrexham. Yes, It's going to take a while for Ricketts to get Wrexham out of his system and adapt to being a League manager. Matty Harrold with the winner, good lad. The amount of whinging on this board I think there are quite a few who do have ginger hair. If there were no fools there'd be no fun.......Good job me and you are here then. Please keep this thread clear for theNOTORIOUSfbs to congratulate us. He will be lying in a gutter somewhere by now. Blimey, fair play,he did, he's on the match thread. Who did get they get beat by today? The Dog & Duck or the Kings Head? We're going nowhere under Grandpa Chester. You don't know where the next goal is coming from. Never mind a win. 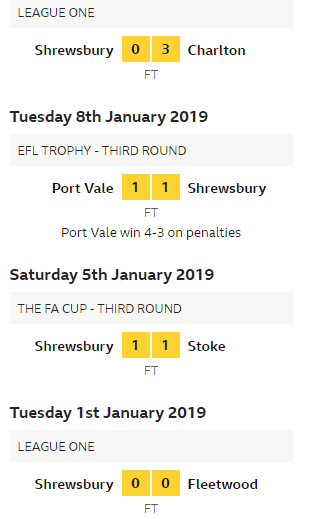 Shrewsbury aren't exactly firing all guns either. The FA Cup win was barely the only highlight in six games or so. So what's your Wrexham FC highlight of 2019 been so far? Hark now hear the chirkshrew sing? And the rest of the other farm hands..? We are 4th in the League. 4 points off the top of the table. Unbelievable! YOU! YOU, ON THE OTHER HAND, ARE IN A WORSE SITUATION THAN US!!!! YOU'D WON 5 OUT OF 6 BEFORE RICKETTS ARRIVED......!?!?! YOUR FORM, APART FROM THE 'MIRACLE OF THE BRITANIA SECOND HALF' HAS BEEN ......cr@p!!! You've gone out and signed up a manager with no League managerial experience. Again! Sacked a manager who'd won 5 out of 6!!! Say nooooooo more! We've ignored Askey agin, gone for the cheap option, after failing to get Dennis Lwrence, and got Grandpa Chester!!! We can change it around. Can you? Exciting relegation battle for Shrews fans awaits! Don't you just love someone who has to use CAPS LOCK to try and emphasise a point? You maybe 4th but you are in a pub league you d!ckhead. At least he's back in his rightful thread now. Let's see what happens with all that lovely cup money in our January transfer window, this is Rickett's chance to prove himself at a league club. I thought Fylde was a rugby team tbh. Change it round like they have done the previous 11 years. Its when you see that number. 11. When you realise just how long a time that is of abject failure and mediocrity. And then in those 11 years they have had just 3 occasions when they've actually been good enough to end their suffering. And each time they have failed. Spectacularly. Its not looking good fbs. Not a good for our friends over the border, they must be proud, but sometimes it's a fine line whether you get caught as we have all heard it at some point or another wherever you go. I'm surprised Towns fans didn't run into them on Saturday with us at Blackpool and them playing the Dog and Duck in Fylde.